Blue-winged Teal, Branchburg Twp., NJ, Mar. 27, 2014 (photo by Jonathan Klizas). 5 Blue-winged Teal have been roadside occasionally at the flooded field on Opie Road, Branchburg for the past few days. A Cackling Goose was with Canada Geese further up the road. Cackling Goose, Branchburg Twp., NJ, Mar. 27, 2014 (photo by J. Klizas). Boonton Reservoir continues expanding its thawed section of water. 3 Common Loons in alternate plumage and 100+ Common Mergansers were highlights this afternoon. Lake Parsippany has 550 Common Mergansers, counted in ones, fives and tens, spread over the surface of the lake. 48 Ring-necked Ducks, 3 Lesser Scaup, 11 Hooded Mergansers, 1 Pied-billed Grebe and 2 American Coot were almost lost in the Common Merganser crowd. The Red-necked Grebe of Mendham spent day no. 34 at Clyde Potts Reservoir. Lake Hopatcong is thawing ever so slowly. Alan Boyd eBirded 5 Common Goldeneye from Nolan’s Point along with the 2 resident Bald Eagles. Other areas had small amounts of Ring-necked Ducks, Bufflehead, Common Mergansers, etc. At Lake Musconetcong, Alan had a Canvasback, Redhead, 2 Common Goldeneye, 2 Horned Grebes and a collection of Ring-necked Ducks, Buffleheads, Hooded and Common Mergansers. Canvasback at Lake Musconetcong (photo by Alan Boyd). In Chatham Township, Simon Lane had 3 flyover Tundra Swans and 2 Bald Eagles as yard birds today, viewed from his deck. Waterfowl at Duke Farms included: 28 Wood Ducks, 2 Gadwall, 14 American Wigeon, 29 Am. Black Ducks, 2 Blue-winged Teal, 2 Northern Pintail, 12 Green-winged Teal, 127 Ring-necked Ducks, 7 Hooded Mergansers and 16 Common Mergansers. A Red-headed Woodpecker was heard near Otter Lake (Jeff Ellerbusch). Remember how bitterly cold and windy yesterday afternoon was? Jeff Ellerbusch conservatively counted (his terminlogy) 400 Tree Swallows over the Raritan River along the Delaware and Raritan Canal Towpath. 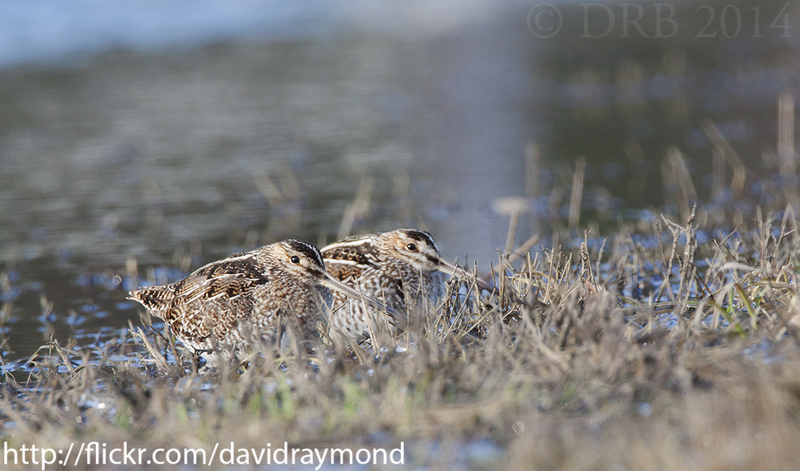 Below is a photo by Dave Blinder of two Wilson’s Snipe from Green Pond Road, Rockaway Twp.